Je sais bien que l'habit ne fait pas le moine, et par conséquent que tout le monde n'a pas la même longueur d'index et/ou de majeur suivant les cas, mais ces deux appareils ont attiré mon attention à force surfer sur les forums anglois voir USois. •	Design: All "E"Motion controllers are built on a fiberglass frame with floating silver power contact, stainless steel hardware, and heavy duty wire. 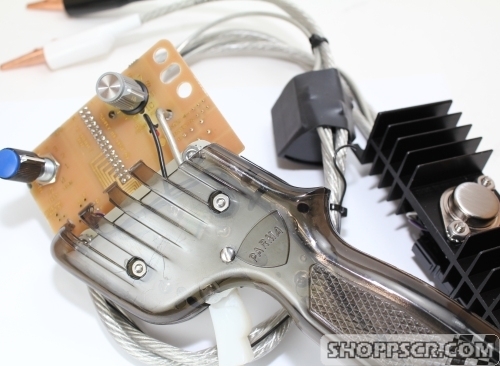 The circuit board is nickel plated and will not need to be oiled or corrode like plain copper designs. •	Flexibility: Unlike resistor based controllers which are designed to work for a very narrow range of applications, the "E" Motion controller will work with virtually any 1/32 motor. •	Control: The 30 band design provides a wide range of control which can be easily adjusted to match the car (motor, chassis, tires, magnet/no magnet, etc. ), track (layout, surface, etc.) or even lane you are racing. The DD302 HD30 comes standard with a 290 ohm "resistor network" (by comparison, the 15 band DD300 and DD301 have 300 ohms of total resistance). The resistor network is mounted to the controller via a small PCB. Additional resistor networks with different values are planned for the future. The optional networks will allow racers to further tune the performance characteristics to meet their specific requirements. •	Sensitivity: New wider range of sensitivity. •	Braking: Difalco Design controllers give you better brakes! 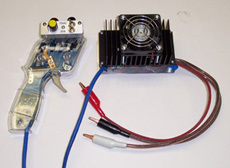 Other designs use the circuit board and skinny wires to carry braking current which adds resistance to the brake circuit and increases the car's braking distance. Rheostats matched to 1/32 cars have proven very reliable. •	Option All new design! The simplest way to add variable brakes to your Parma Turbo resistor controller. Now features our full range economy brake rheostat. Simply bolt the rheostat bracket to the top resistor barrel, then splice two wires into the controllers brake line. Variable brakes will smooth out your driving and lower your lap times. •	Traction Control: This is an optional feature which allows racers to adjust how much voltage is sent to the track when the controller trigger is NOT in the full-on position. When the trigger is in the full-on position, the feature is bypassed (i.e. full power is sent to the track). Some racers incorrectly refer to this as a "choke". Use the "Traction Control" option in the order section at the top of this page to indicate if you want the Traction Control feature (+$25.00 USD) or not. •	Power: Difalco Design controllers can deliver more power to the track! Heavy duty components throughout ensure 100% of track power gets delivered to your car. Stranded copper 10 AWG lead wires can handle the most demanding 1/32 power requirements. A heat sink ensures components remain cool which further increases reliability. •	Lighter Weight: Components designed specifically for 1/32 racing are lighter than their 1/24 counterparts. For example, the ultra-lightweight heat sink is considerably lighter than heat sinks used on 1/24 controllers yet provide excellent heat dissipation for even the most demanding 1/32 applications. The result is a lighter controller which still retains the overall build quality Difalco controllers are famous for. •	Track Polarity: Fanatic positive polarity models can easily be switched to negative polarity just by switching two soldered wires. If you regularly run on both polarity tracks we recommend you purchase a dual polarity model for the simplest polarity conversion. This is a special order (5-6 week lead time) item - please ontact us for ordering details. •	Circuit Protection: The "E"Lectronic reset fuse protects the brake circuit and reverse polarity diode saves the transistor from incorrect hookup. •	Reliability: High-quality components combined with a race-proven design result in a controller you can count on during the most demanding race conditions. •	All "Mosfet Powered Design" 3rd Eye's Exclusive "FetDrive" Motor Drive / "FetBrakes". •	"Differential Amplifier Technology" Power control uses the test of time proven design. •	"No Power Blast Relay". Full on power" is done electronically, the "FetDrive" has less resistance to the battery and faster response than a Power Blast Relay. •	"More useable Throttle Range" @ the near max where a Power Blast Relay would jump 1-2 V directly to battery. Now 20 bands more of usable Throttle. •	3rd Eye's exclusive "FetBrakes" Braking (stops the car on a dime and gives 9 cents change); stops car even after the track power goes off. •	"Infinitely adjustable Brake and Sensitivity controls" (0-Max) control from onset to full. •	"Sensitivity Control Voltage goes to .5V - 3/4 Throttle" Provides all car maximum control. •	"Selectable Throttle Curve" 4 settings for "Improved Throttle Response" softer bottom end response. •	"Smooth trigger action/Continuously variable throttle control" (no steps) 150 bands). •	"No Trigger Dead Band" no trigger travel from brake to power = faster lap times. •	"Electronic Choke (Voltage limiting)". Sensitivity does not interact with Choke limit. •	"Choke On/Off Switch" Assure's Choke is off and settings can be preset. •	"Full Throttle Bypass Switch" (FTB) Overrides Choke at full throttle. •	Built in "Mush button" for wing cars standard. •	"Track Mounting Bracket" Power Assembly sets firmly and securely on the track. •	"Light weight Handle" with easy to use controls located at the top and sides. •	Attractive "Professional looking Styling" with RedFox Handle and Trigger (used exclusively). •	High intensity "Blue Power LED Indicator" located in the handle. •	12" Long 12 gauge "highly flexible power leads". •	Available Soon: "LCD Track Volt Meter" option onto the power Assembly Cover Plate. •	Available in the near future: "Traction Control" Under development at this time. Activate maximum speed without the car breaking traction. In the choke mode, at full throttle ramps voltage to the car up to the battery with the rate controlled by the user. •	22nd Century - fully electronic high technology linear design. · “Hyperdrive” high gain/high power/low voltage drop Motor Driver circuit. · “Mosfet Powered” Braking (stops the car on a dime and gives 9 cents change); stops car even after track power goes off. 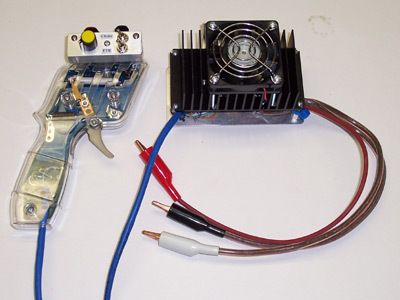 · “Mistake Proof” reverse polarity protection, No fuses to replace. · Excellent Throttle Response optimized for all cars and driving types. · “Continuously variable throttle control” (no steps) 150 bands). 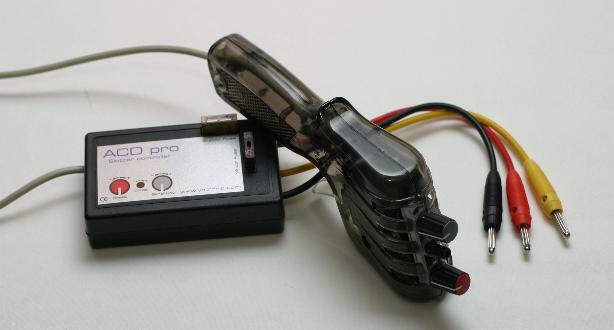 · Smooth trigger action with “No Deadband” from Brake/Throttle (reduces track times). · Light weight Handle with easy to use controls located at the top. · Infinitely adjustable Brake and Sensitivity controls (0-Max). · High intensity Blue Power LED Indicator (Illuminated Logo) located in the handle. · BI color LED Indicates Brake and Throttle Level. · Built-in “Clicker” (Absolute maximum power to the motor at full throttle). · Mounting Bracket allows ease of hook-up and maximum cooling. 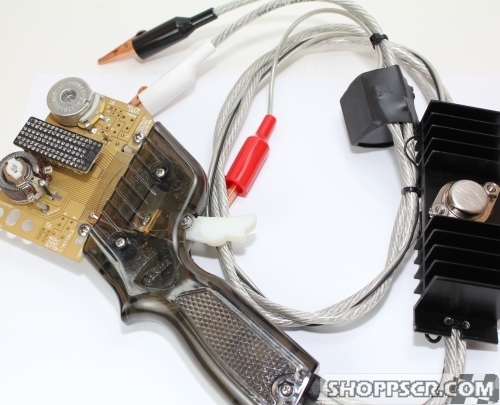 · 12” Long 12 gauge highly flexible power leads. · Unique “0 ClearanceTrigger Bushing Design” (adjusted during assembly). · “Select switch” allowing a very wide Sensitivity range Option/Add on available. · “Mush” Button for Wing car usage (rolling through glue) Option/Add on available. · “Track Volt Meter” Option/Add on available. · “Dual cooling Fans” Option/Add on available. · “Fully Electronic Choke” Option/Add On Available. · “Manual Choke” (Standard 2ft lengths or selected Lengths) Option/Add on available. What do you about its? J'ai toujours lu de bons retours à propos de ces poignées sur les forums US, mais (car il y a un mais) le gros problème c'est, il me semble, de ne pas pouvoir les tester avant d'acheter. Remember ma poignée Slot.it sur la sinistre piste 3: ces poignées électroniques ne supportent pas forcément très bien les défauts électriques. Les Professor Motor sont très bien aussi, mais le même problème se pose pour les essayer. Si tu veux vraiment une électronique, tu peux te pencher sur le cas de la Yatronic, car un membre du club pourrait au moins te la faire essayer (Bruno / taz). D'autre part les NSR (Parma modifiées) sont douces, polyvalentes (4 valeurs de résistance), très fiables et contiennent très peu d'eléctronique (juste un potar pour le frein) , c'est peut-être vers cette solution que j'irais si je n'étais pas déjà équipé. D'ailleurs, a quoi sert ce boitier indexé à la yatronic, je ne suis pas assez bon en Allemand pour comprendre?? Je crois cependant comprendre que par rapport à la slot it, il n'y a pas forcement de cartouche interchangeable, cela peut il limiter le risque? La piste du club est branchée comment en positif ou négatif? La piste du club est en Common Ground (masse commune). Je préfère ce vocable qui est plus explicite que positif ou négatif. La Yatronic a, il me semble, un inverseur de polarité, mais il faut voir avec Taz car il me semble qu'il a eu des soucis à ce propos. pas de problème de polarité car il y a un inverseur, faut juste trouvé le bon branchement. "Le boitier L'ACD par Prévenir adaptateur de frein La fluctuation de la tension sur l'alimentation. Cet adaptateur peut être connecté directement à l'ACD par contrôleur ou à l'alimentation elle-même".? Aucun frottement, ultra silencieux, pas de mécanique, donc pas de réglage de buté ou de fil a changer etc..
Cette poignée comporte différents réglages. le réglage du frein, de la sensibilité (résistance) et de la tension. Le potar rouge c'est le frein, le potar gris c'est la sensibilité (la résistance) le petit potar noir le réglage de la tension, en fait ce dernier réglage, permet de baisser la tension d'alimentation de la voiture, si la piste est alimentée en 15V par exemple et que c'est trop pour vous vous pouvez baisser cette tension directement sur la poignée. Bon j'ajoute mon grain de sel qui n'a rien d'une parole d'évangile. En premier, c'est marrant de voir cette débauche d'exotisme dans les solutions techniques et la faible diffusion de ces modèles en France. Ensuite, pour avoir testé la Slot.it et la Yatronic, je ne suis pas fan car je n'ai pas de sensation à cause du ressort de rappel très faible et de l'absence de frottement. Si cette douceur est très appréciable à vide, il me manque des infos sur la position du curseur alors que le contact sur les spires de cette bonne vieille résistance bobinée me "dit" en permanence où se trouve le curseur. Sinon, sur une piste soit glissante soit sinueuse je gagne des 10èmes et de la décontraction avec les poignées électroniques. En conclusion, comme nous pratiquons le slot de façon vintage avec des moteurs peu puissants je préfère la solution toute analogique qui a aussi l'avantage de ne pas tomber en panne. Je crois que c'est pour beaucoup une histoire de philosophie et de feeling. En somme si nous roulions en Davic avec des avions de chasse aimantés je préfèrerai une poignée électronique mais là, définitivement non. PS : pense aussi à ta façon de prendre la poignée en main. Pour moi l'encombrement sur la partie supérieure fait que je ne sais pas trop où mettre la main qui n'actionne pas la gâchette.